In the remote past, Odisha was inhabited by the aboriginal tribes, who had a civilization and culture quite distinct from that of the Vedic Aryans. The Aryans migrated to Odisha at a later stage and the Vedic religion and culture along with the Upanisadic philosophy and Smarta rituals then began to spread in this country. Buddhism had better times during the rule of the Mouryan emperor Asoka, who conquered Kalinga (the coastal region of Odisha as known by that time) after a dreadful war in the third century B.C. It is said that after the conquest of Kalinga, Asoka abandoned violence, embraced Buddhism and left no stone unturned to propagate it throughout India including the newly conquered Kalinga. It continued to be popular in Odisha for several centuries before Sankaracarya visited Puri in the ninth century A.D. Jainism was perhaps at the height of its glory when Kharavela espoused its cause and took all steps to propagate it in the second century B.C. 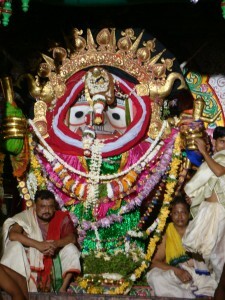 It is, therefore, historically reasonable to hold that the cult and culture of Jagannatha found its origin in the primitive system of worship of the non-Aryan tribals who had established a Shreene for Jagannatha here, in this part of the country in a very ancient time, with all their religious fervour. The. Aryans must then have taken it over to worship Jagannatha in Vedic rites and rituals with all religious practices connected with them. Buddhism and Jainism must have penetrated in to the innermost apartments of the Shreene of Jagannatha with all their religious and spiritual implications. But it has not been possible till now to speak with an air of authority, as to which of the rites; rituals and details of the day-to-day service (Vidhis) of Lord Jagannatha owe their origin either to Jainism or to Buddhism. The Puranic texts corroborate that Jagannatha was originally a deity of the aboriginal tribes and was known as Nila Madhava, his image being made of some sort of blue stone. Later, the god manifested himself in the form of four wooden images that we worship now and came to be known by the present-day names in anatmosphere of Vedic re-orientation. 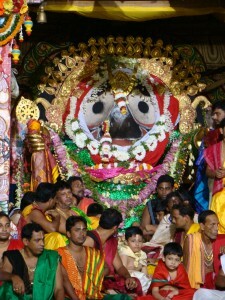 Thus,Jagannatha is equally claimed by the aboriginal tribes and the Vedic Hindus to be their original deity of worship. There are in India numerous religious cults and creeds that draw inspiration from the Vedas and also from other important Hindu scriptures. The pantheistic way of Indian religious life has resulted in the establishment of a large number of centers of worship all over the country dedicated to various gods and, goddesses by different sects and communities. There are evidences in history that at some point of time, there were bloody clashes between different communities each eulogizing its communal gods and goddesses. Such internal feuds among the religious communities helped in the growth of Jainism and Buddhism. There was another class of religious practitioners who believed in occult practices and for achievement of their objects, worshipped many gods and goddesses. Such esoterism (Tantra) gave rise to the worship of Sakti in her ferocious form. The worshippers of Siva and Visnu also contemplated different forms of their gods, their consorts, family members and incarnations. Ultimately the followers of Visnu dominated and claimed the gods and goddesses of other communities to be the subordinates of Visnu. Finally in the 9th century, Sankara advocated non-dualism and preached for one ultimate god. Findings that the Hindus believed in the worship of a number of gods and goddesses, he recommended the worship of selected gods and goddesses each symbolising some aspect of human aspiration, and in course of time five of them became the most important. They are: (a) VISNU: The cosmic sustainer of the phenomenal universe and bestower of salvation. He is the supreme god of Vaisnava sect. (b) SIVA: The cosmic destroyer of the universe and the supreme god of Saiva sect. (c) DURGA: The Mother goddess, the source of all energy (Sakti)) the deity of the Tantric worshippers. (d) GANESA: The destroyer of obstacles and the fulfiller of desires and (e) SURYA: (the Sun) The most brilliant manifestation of the synthesis of the cosmic trio of the Hindus. Subsequently different Vaisnava saints advocated for worship of different forms of Visnu and his a avatars or incarnations. They are Ramanuja, Ramananda, Nimbarka, Vallabha, Madhva, Caitanya, Kabir, Nanak. Tuisi Das etc. and these forms and incarnations are, to name a few, Nrsimha, Krisna, Rama, Narayana, Gopinatha, Madhava, Ananta Sayana and Vasudeva. Worship of Laksmi and Saraswati as the wives of Visnu, either with their husband or alone also prevailed. Similarly Radha and Sita were also worshipped along with Krisna and Rama respectively. There are many temples in different parts of India which are dedicated to one or more of these five deities and their different forms and manifestations. But excepting a very few, where the presiding deity of the temple is worshipped as an assimilation of only one or two deities, all the rest are meant for the worship of only one of these deities in the body of one image installed in the temple. It will be revelation to many that Jagannatha is worshipped as Narayan or Visnu when he is on the dias (Ratnavedi) in the sanctum sanctorum, as Ganesa when on the, Snanavedi during the Snana . Festival, as Rudra (an expression of Siva) during the Nava- Kalevara ceremony, as Durga in: the Sayana festival and as the Sun when on the chariot-during the Car festival. 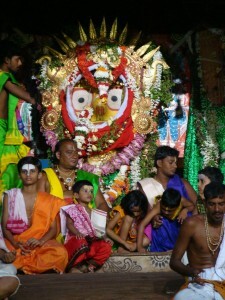 This apart, when the followers of different religious cults visit Puri on pilgrimage, they worship Jagannatha as the highest expression of the God, whom or whose image they worship according to their particular schools of philosophy and theosophy, forgetting at the moment as to how he, in the Puri temple, is viewed by the devotees of the other religious cults. The Vaisnavas of Ramanuja sect worship Jagannatha as Narayan, Vasudeva, Nrsimha, Hariand so on, while those of Ramananda look upon him as Ramacandra. Other Vaisnavas sects treat Jagannatha as Krisna. Odishan Vaisnavas consider Jagannatha as the combined body of Radha and Krisna. It will be lengthy to give a complete list of such interpretations and representations. This would explain that Jagannatha represents an assimilation of all religious cults, creeds and sectarian philosophies that come under the purview of Hinduism in the broadest sense of the term. With such a cultural background of Indian social life, one may like to know, if the world famous temple of Jagannatha has got any message to deliver. There is a saying in Odisha that ‘In Puri, there is no caste system. In other temples of India, people of some castes such as the sweepers, the washer men etc. are not allowed into the inner apartments, but in the Puri temple, they are not only allowed entry, but people of these castes discharge certain specific duties and services for the performance of some traditional rites for Jagannatha. There is yet another aspect. of the question that deserves to be mentioned here clearly. As stated earlier, Vidyapati, who is credited with the discovery of Nila Madhava (the original form or image of Jagannatha) married the daughter of Viswavasu, the chief of the’ aboriginal tribes. Later on, he was blessed with children through this lady. It is really interesting to note that even to this day, ..the descendants ‘of both Viswavasu and Vidyapati discharge the most important vidhi of the temple. They are known as Daita-Pati i.e. descendants of Viswavasu and Vidyapati. Most likely the word Daita is from Daitya or a person of non-Aryan society and Pati is from Vidyapati and they have been combined to connote that they, divided into two sections, are the descendants of both the aboriginal chief and the Brahmin priest. In a society torn under caste discriminations, the so-called high-caste Brahmins do not partake food if touched by the so-called low caste people. But the food offerings of the Jagannatha temple which is called Mahaprasada (literally the great grace) is a wonder of the Hindu world. It is the established practice that the moment this Mahaprasada is served, no Hindu of the so called high castes objects to partake it even from the same plate with any person of the so-called low castes. Usually persons of all castes are seen enjoying Mahaprasada sitting in one place in a row. The Car Festival held in June-July every year is symbolic of many lofty ideals of a highly developed society where equality in treatment and of opportunities are considered to be the fundamental right of every individual. When theosophy and religion are viewed from this point, it becomes imperative that everybody should be treated as equal in the eyes of God. The Car Festival, participated by lakhs of pilgrims from the whole of India, has a number of vidhis or practices in connection with the pulling of the chariots and the journey of Jagannatha to the garden house. One of the vidhis is called Cherapahanra. This literally means, the sweeping of the floor. On this occasion, when the deities are brought from the main temple and placed on the special seats designed for them on the chariots, the Raja of Puri who is recognised as the scion of the earlier sovereign emperors of Odisha and presently holds the most important office of Chairman in the management of the temple, is required to sweep .the floor of the chariots in front of the deities with a golden broom-stick. Thousands of eyes watch the performance with rapt attention. Amidst uproarious clappings, the mammoth gathering offers its felicitations to the traditional head of the State as he performs the duties of a sweeper. This vidhi bring home the idea to everybody that the highest political head of the State is not superior to a sweeper in the eyes of God, who is the supreme object of, worship by everybody on the face of earth. Needless to say, this vidhi or practice is symbolic of the highest form of social justice and equality that has remained an objective to be realized by humanity in. all walks of life. It is a fact that non-Hindus are not admitted into the Puri temple, but the Hindus of all castes, including the aboriginal tribes, the Jainas, the Sikhs and the Buddhists are all allowed into it. The reason why the temple of Jagannatha is so popular may properly be appreciated when it is realized that it is very broad-based from the view points of theosophy find religious culture.